Thomas (also nicknamed Thomen) was born the 11th of March 1970 in Krefeld. He is married and has a son. He was a member of the group since its inception in 1984, but he leaves his place to Hans-Peter Frey on the second demo (Battalions Of Fear). 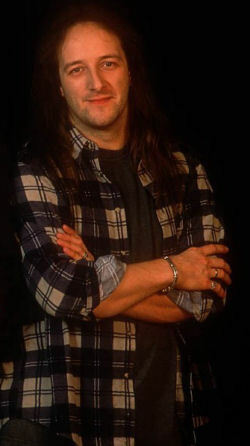 Thomas has served for 20 years with Blind Guardian and in 2005 he decided to leave the group. He is one of the only members to have been a fairly active poster on the official forum of the group (Marcus spends sometimes) and on the #Tavern (Official IRC channel of the group). Shortly after Blind Guardian, he joined Savage Circus where he worked with Piet Sielck that he had already spent in Iron Savior. He left the group in 2007 due some personal problems. In 2006 he joined Coldseed where he works with Oliver Holzwarth and Michael Schüren, the two sessions members of Blind Guardian. His favorite taste is vanilla. Spinach in cream with cooked potatoes and fried eggs are his favorite food. His favorite drink is iced tea (peach or lemon). The colors he likes most are dark blue, black and red. The Sixth Sense, From Dusk Till Dawn and Braveheart are his 3 favorite movies. His favorite book? Instruction manuals (never ending stories!) . Thomas likes playing chess and watching football. His favorite groups are Judas Priest (Rob Halford period), Queen and Queensryche (up to Promised Land). Rage For Order Queensryche is his favorite album. His hobbies are movies and computer. Thomas has one dog and four cats. George W. Bush, Bill Gates, the manipulation of genes and cloning frighten Thomas. Thomas is happy when he plays on stage and when he goes on holiday with his wife. He loves football and darts. Visiting Ireland pleased him very much. He was most impressed by visiting Japan and the body of his wife.